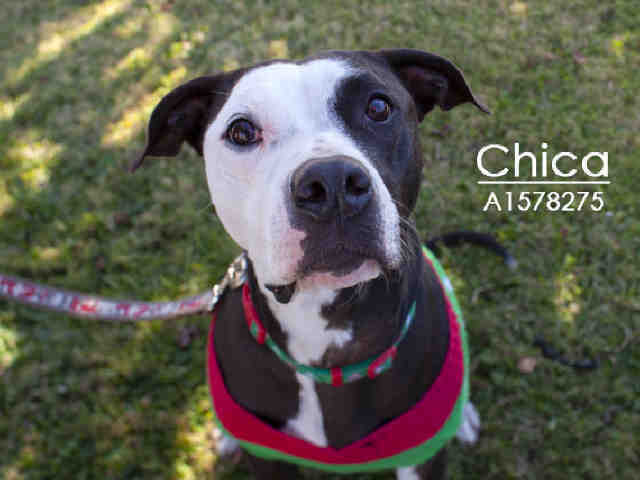 Chica has tons of personality! This sweetheart loves going for rides, spending time with children, and wrestling with bigger dogs. She is a total hoot! Come meet her today! Not what you were looking for? You can adopt a different pet in Houston by using our search feature and adjusting the radius. Thank you for helping our animal shelters and rescue groups with pet adoption! BARC is the City of Houstonâs Animal Shelter and Adoption Facility. BARC is the only city shelter in Houston required by law to accept every animal that comes through our doors regardless of breed, temperament, health conditions, and circumstance (from owner surrender, stray pickup, rescued or confiscated animals). We have built a best-in-class team that stewards our mission of professionalism, responsibility, compassion, commitment, integrity, and accountability BARC is 100% dedicated to pet adoption. In addition to sheltering and providing veterinary care to all animals brought to the shelter, we work diligently to place these animals in new homes. We collaborate and coordinate with our Houston Pet Rescue groups and through social media networks to cast the widest possible adoption net. We also provide intensive neo-natal and adult pet fostering programs, along with hands-on volunteer training classes and continuous workshops. We are committed to promoting responsible pet ownership through spaying/neutering, microchipping, vaccinations, and training class services. Campaigns and programs to educate and raise community awareness about these services are ongoing. Houston has the largest urban land area in the U.S. Its size and unique characteristics create challenging circumstances in regards to animal population and control. In addition to a year-long breeding season that steadily increases the areaâs animal population, our semi-tropical climate serves as an incubator for fleas, ticks and other parasites harmful to animals. Houston is an urban metropolis, but it is also home to various species of wild animals and reptiles including coyotes, bobcats, bats, raccoons, opossums, skunks, foxes, snakes and even alligators. Because of this, rabies outbreaks are a special concern. A rabies vaccination is required to license your pet, and a pet license is mandatory in Houston. BARC serves as the licensing facility. We work hard to educate the public about rabies prevention and about co-existing with our extensive wildlife population. Our goal is to provide animal control and care services that minimize fear, pain, stress and suffering to animals in and out of the shelter and we work to ensure safe and healthy human-animal interactions. We work closely with the City of Houston Police Department and Houston Animal Control to respond to animal cruelty and abuse reports, behavioral complaints, dog bite cases and animal/gang related issues. To adopt, you must be 18 years of age and you will need a state-issued photo id with current address. If the address on your id does not match your current address, please bring a utility bill with current address. You will complete an application here at the shelter, and as part of the application, you will need to show proof of homeownership or provide your landlordâs contact information, as well as proof of paid pet deposit or that payment arrangements have been made. In most cases, home ownership can be verified online. Please check the pet policies at your residence, including any breed or size restrictions, prior to visiting the shelter. You should have permission for the pet from all adults in the household. Your application will be reviewed to ensure that you can provide a loving home with the proper environment and care needed for the pet you have selected. Be prepared to spend some time at the shelter--pet ownership is a lifelong responsibility so we want you to spend time getting to know the animals, and we want to help you to make a choice that is a good fit for you! If youâve found a pet online or wish to come in person to view our dogs and cats, the BARC shelter is located at 3200 Carr Street, Houston, Texas 77026. We also have offsite adoptions. Animals that are already spayed/neutered are able to go home the day of the adoption. Otherwise, they are scheduled for surgery the next available weekday and the adopter may pick up their new pet that same afternoon. BARC supplies cardboard enclosures for transporting cats and leashes for adopted dogs. Because BARC cares first and foremost about the safety and well being of our animals, people who want to adopt must complete an adoption application and agree to an interview with BARC respresentative. BARC encourages responsible pet ownership; we only adopt out animals to people who are qualified to meet the needs of bringing a new pet into their lives. BARC only allows adoption of companion animals. Companion animals are just that, companions...they are adopted as pets and for no other reason. BARC uses criteria based on the animalâs behavior and health to determine whether an animal is fit to be a companion. This decision is solely in the discretion of BARC. BARCâs decision in this matter is final in all cases. Animals that arrive at BARC may not be immediately available for adoption. We set a specific timeframe that gives us sufficient time to assess the animalâs health and behavior, as well as to allow owners a chance to claim their lost pets. Once that time frame has passed, the animal will become eligible for adoption. Animals that are too immature or not healthy enough for spay/neuter surgery are not available for adoption but may be available to be fostered. Please check with the shelter for our foster requirements. Take one of our pets home and receive the gift of the unconditional love. Our standard adoption fees are as follows: â¢Dogs - $50 â¢Puppies (4 months and under) - $75 â¢Cats - $20 â¢Kittens (4 months and under) - $35 â¢PurrFurred Pets (animals that have been at the shelter 20 days or longer) - $20 for cats/dogs â¢Veteransâ Companion Program â Half off the full adoption fee for all dogs/$20 for all cats for Active Military & Veterans with proof of service â¢Seniors for Seniors â Animals 2+ years old are FREE to qualified adopters over 60 years old (City of Houston residents must pay $5 for city license) With your new pet you will also receive: Spay/Neuter Surgery Microchip with lifetime registration Initial Vaccinations Rabies Vaccine City License (if within Houston city limits) Enrollment in AKC Canine Good Citizen Obedience School and more!